SUBHEAD: Fukushima operator to review its massive erroneous radiation data. What a surprise! Image above: Photo looking into Fukushima Well No. 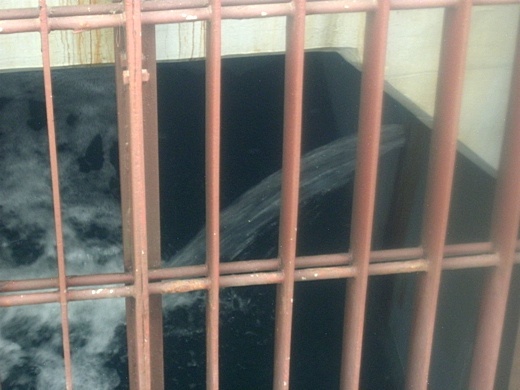 1-2 showing water gushing in behind iron gate directly from Reactor #2 on 4/5/11. At that time water at the crack, outside the pit: 5.2 million becquerels/cubic centimeter of iodine-131. From (http://ex-skf.blogspot.com/2013/07/fukushima-i-nuke-plant-radioactive.html). The operator of the damaged Fukushima Daiichi nuclear plant has decided to review radiation data after finding the initial readings may be much lower than actual figures. Tokyo Electric Power Company, or TEPCO, says it has detected a record high 5 million becquerels per liter of radioactive strontium in groundwater collected last July from one of the wells close to the ocean. That's more than 160,000 times the state standard for radioactive wastewater normally released into the sea. Based on the result, levels of radioactive substances that emit beta particles are estimated to be 10 million becquerels per liter, which is more than 10 times the initial reading. TEPCO initially said it had detected 900,000 becquerels per liter of beta-emitting substances. The utility attributes the error to the improper measuring method that had been used until last October. It says the readings of radioactivity can be measured as being lower than they actually are in the highly contaminated water. TEPCO plans to review other data measured with the improper method, including the radiation level of around 300 tons of waste water that leaked from a storage tank in August. An initial test of the leaked water found it contained up to 80-million becquerels per liter of beta-emitting substances, including strontium. Jiji Tsushin just reported the same thing. The information is from the press conference on February 7, 2014. For more information about the RO waste water leak of August 2013, go to this link. Of that, strontium-90 alone turned out to be 5 million Bq/L. The reason (excuse)? Wrong measurement method used. Or something to that extent that even people who know a lot about nuclide analysis are scratching their heads trying to figure out how that happened. On February 6, TEPCO announced that 5 million Bq/Liter of radioactive strontium was detected from the groundwater sample taken on June 5 last year from one of the observation wells on the embankment of Fukushima I Nuclear Power Plant [the embankment is located between the turbine buildings and the plant harbor]. The density is 160,000 times that of the legal limit for release into the ocean, and it is about 1,000 times that of the highest density in the groundwater that had been measured so far (5,100 Bq/L). TEPCO didn't disclose the result of measurement of strontium alone, as the company believed there was a possibility that the result of measurement was wrong. As to this particular sample, TEPCO had announced on July last year that the sample had contained 900,000 Bq/L of all-beta including strontium. On February 6, TEPCO explained that they had "underestimated all of the results of high-density all-beta, which [in fact] exceeded the upper limit of measurement." 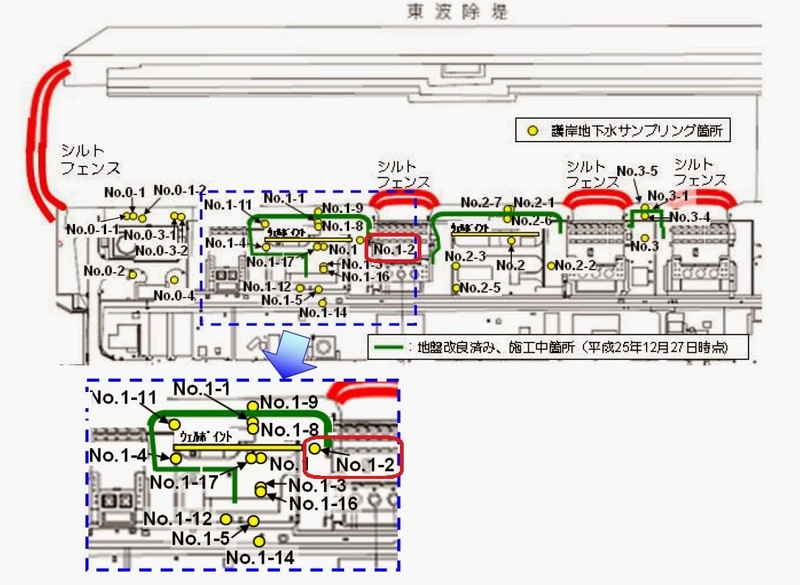 This particular sample may contain about 10 million Bq/L of all-beta, according to TEPCO. The company recently switched to a different method of analysis that uses diluted samples when the density of radioactive materials is high. 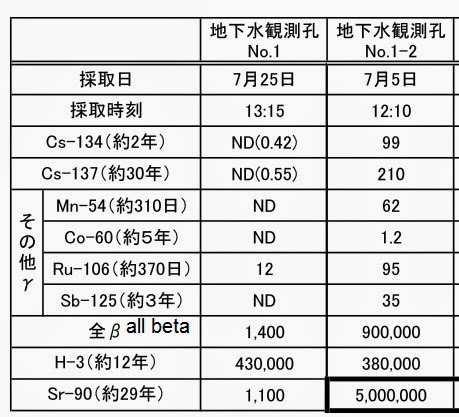 So this is the lowdown of the case of strontium more abundant than all-beta, all thanks to the faulty measurement by TEPCO. 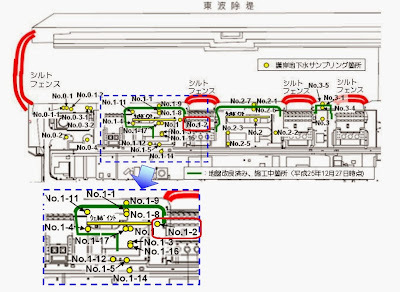 Browsing through the documents released by TEPCO, the particular observation hole was No.1-2, which is no longer used as the result of waterglass injection into the soil in the embankment. It is close to where the extremely contaminated water from Reactor 2 turbine building had been found leaking in April 2011 (via the underground electrical trenches). 10,000,000 Bq/L of all-beta, or 10,000 Bq/cubic centimeter of all-beta. That's the same order of magnitude of all-beta in the water that gets contaminated after circulating through the reactors (see my September 2013 post), but the levels of cesium-134 and cesium-137 in this sample water is too low for this water to be the contaminated water that is currently circulating the reactors.